Synopsis: It was the same every morning. Wake up, grab the ice skates, and head to the rink while the world was still dark. For ten years, figure skating was Tillie Walden’s life. She woke before dawn for morning lessons, went straight to group practice after school, and spent weekends competing at ice rinks across the state. It was a central piece of her identity, her safe haven from the stress of school, bullies, and family. But over time, as she switched schools, got into art, and fell in love with her first girlfriend, she began to question how the close-minded world of figure skating fit in with the rest of her life, and whether all the work was worth it given the reality: that she, and her friends on the figure skating team, were nowhere close to Olympic hopefuls. It all led to one question: What was the point? I always love sports stories despite not enjoying playing sports. There’s something about watching a protagonist grow and transform through the use of sport. However, this is not entirely that story. This graphic memoir looks back on Tillie Walden’s relationship to figure skating, understanding her sexuality, and falling in love with art. First off, I am a big fan of graphic memoirs. They are an interesting medium for telling personal stories, and Walden’s is one I think many readers can relate to, particular what it means to fall out of love with someone and in love with something (and someone else). You see throughout the course of the story that Walden’s passion for figure skating changes, that it doesn’t feel fulfilling. You also see what is keeping her there – her first love, a girl, whom she is over the moon for. We learn in the story that Walden has known she was gay since she was quite young. We are told that she was afraid of coming out for so long, but because of how young she was it was easier to have girls come over for sleepovers and her parents think nothing of it. She talks about how living in Texas is was scary to be young and gay, especially when society pushes it’s agenda of marriage and kids. I felt for Walden, especially when she talked about her fears and how concerned she was if people found out she was gay. The book shows how she was bullied and tormented be it at school or at figure skating practice, and she never truly gets to feel satisfied in her own skin. Spinning is a gentle story about growing up. Tillie Walden shares such a powerful narrative, and her artwork does an amazing job of showing the intense feeling of what happened in her life. I LOVED the artwork and chromatic colouring in this graphic memoir and I think it just adds such a beautiful layer to such an emotional story. I felt nothing but sympathy for Tillie, but I felt so proud towards the end when things finally came together. This entry was posted in Uncategorized and tagged book review, contemporary, first second, graphic novels, Sam, sports, ya, young adult on September 13, 2017 by samcmar. Kwame Alexander, though not a new name for middle grade, is a new name for me. I had the pleasure of reading his short story in the collection Flying Lessons & Other Stories edited by Ellen Oh, and his was easily my favourite. Kwame Alexander has an amazing way with words, and I found his hero in that particular story be so honest and funny, it made me want to explore more of his work. Raincoast approached me to share a review of The Playbook: 52 Rules to Aim, Shoot, and Score in This Game Called Life, which is a book of mixed media. In it contains Kwame’s beautiful words alongside Thai Neave’s stunning photography. Please enjoy my review, an excerpt, and some wonderfully wise words from Kwame Alexander. Huge love to Raincoast again for allowing me to participate in this blog tour. Your friendship and kindness is always appreciated. Synopsis: You gotta know the rules to play the game. Ball is life. Take it to the hoop. Soar. What can we imagine for our lives? What if we were the star players, moving and grooving through the game of life? What if we had our own rules of the game to help us get what we want, what we aspire to, what will enrich our lives? Illustrated with photographs by Thai Neave, The Playbook is intended to provide inspiration on the court of life. Each rule contains wisdom from inspiring athletes and role models such as Nelson Mandela, Serena Williams, LeBron James, Carli Lloyd, Steph Curry and Michelle Obama. Kwame Alexander also provides his own poetic and uplifting words, as he shares stories of overcoming obstacles and winning games in this motivational and inspirational book just right for graduates of any age and anyone needing a little encouragement. I am very new to Kwame Alexander’s work, and I am not going to deny that. When I was asked to help promote The Playbook: 52 Rules to Aim, Shoot and Score in This Game Called Life, I wasn’t entirely sure what I was going to be getting into. I admit, I’m not the biggest sports fan, which was my first worry, but I actually loved the way in which sports were used in this beautiful piece of non-fiction. First off, I adore the writing in this book. Kwame Alexander is a true poet, and I think there is a wonderful simplicity in his poetry that allows for a lot of extra thinking in terms of multiple meanings. I also love that his poems are inspirational, confident and will inspire confidence in others. This book is filled with passion, kindness, and strength. I also loved the way the inspirational quotes were woven into the text, featuring the likes of Babe Ruth, Michael Jordan, Scottie Pippin. I think the quick anecdotes about different athletes and their rise to fame framing each section of the book was also fantastic, as learning about Lebron James and the William sisters was very interesting. Second, I want to praise the use of photography in this book. I think that Thai Neave’s photographs do a stunning job of complimenting the poems and adding support to the text. I love photography and some of the images in this book are just so beautiful, and the way in which they match the text is often quite spot on. When Alexander is writing about the key feelings for the playbook of life such as passion, motivation, determination, etc, the photographs do an amazing job reflecting these emotions and the poem that is written to coincide it. While the writing in this book is stellar, just flipping through it for the breath-taking photographs is equally worth your time. After reading The Playbook, I am very much a newfound Kwame Alexander fan, and I cannot wait to read more of his books. I love how even though this is considered middle grade there is so much wisdom in these pages for anyone or any age group. I think this book would be helpful for parents, teachers, librarians as well, as I feel like they can use this book to help teach some of these “rules” that Alexander shares with his readers. There is so much beauty in these pages, and even if you aren’t a sports fan, the metaphors that are present are completely universal. If you are looking for some inspiration or need some confidence, then check out The Playbook because it will give you with hard truths and a pick-me-up that you didn’t realize you needed. A huge thank you to Raincoast for providing me with this opportunity to share more about The Playbook, as well as Kwame Alexander for writing this wonderful book. If you are curious to learn more about The Playbook, make sure to check out the other stops on the blog tour! This entry was posted in Uncategorized and tagged arc review, blog tour, book review, hmh books for young readers, middle grade, nonfiction, raincoast, Sam, sports on January 25, 2017 by samcmar. Synopsis: It’s his last year at Pine Mountain, and Ryan Dean should be focused on his future, but instead, he’s haunted by his past. His rugby coach expects him to fill the roles once played by his lost friend, Joey, as the rugby team’s stand-off and new captain. And somehow he’s stuck rooming with twelve-year-old freshman Sam Abernathy, a cooking whiz with extreme claustrophobia and a serious crush on Annie Altman—aka Ryan Dean’s girlfriend, for now, anyway. 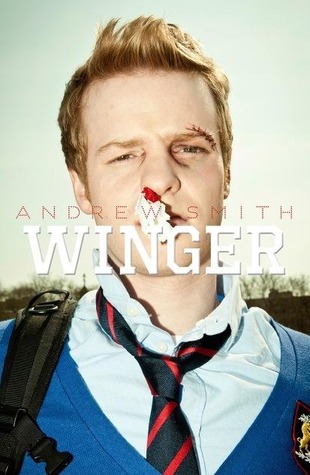 After recently reading Winger, I was a bit worried about this sequel. With the way the novel ended, there was a part of me that wasn’t sure where Smith could go with Ryan Dean West’s story. Colour me surprised when I finished Stand-Off and loved it as much as the first book. If I’m being frank, I really love both equally. This story takes place after a spoil from Winger where Ryan Dean is in his senior year. You’d think Ryan Dean would have some maturity at this point, but when he’s paired with a twelve year old named Sam, well, that maturity goes out the window to say the least. Actually, this relationship easily one of the most humorous and sad at the same time. Sam is so timid and darling, and he’s that kid that you want to hate but you have no real good reason why, and that’s what makes it pretty humorous. However, it also problematic as it shows that Ryan Dean doesn’t want to admit that in some way, he and Sam are fairly similar. Seriously though, I had a good laugh during parts of Stand-Off, and it really does come from Ryan Dean’s narration. There’s something very sharp, witty, yet kind of wimpy in his voice that I was once again completely drawn too. Yet there’s a darker atmosphere to Ryan Dean in this story since he’s haunted by an event from the previous book, and that stays constant throughout. 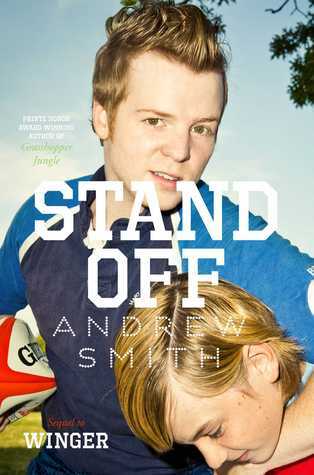 I love the contrast between the serious elements ofStand-Off and the humour, and I think Smith does a great job of balancing these two aspects in a way that shows Ryan Dean’s development. And really, that was the huge thing I loved about this sequel. I loved watching Ryan Dean grow as a person — he’s still as troubled as he was in the first book, but he definitely is looking at high school with a much more critical eye in this story, because in some ways he has grown up, and in other ways he is that very immature kid who refuses to grow up. He struggles to get over some of the problems from the first book, but they aren’t issues that you can just “get over” with ease. Smith goes this amazing job of showing Ryan Dean’s struggles in his growth and development, and having Sam be the contrast works so well in making the reader understand him more. Also, I was super happy with how the relationship between Ryan Dean and Annie was developed in this book. Smith is often criticized for how he writes his female characters, but I thought Annie was a great character and I think her development in this book was solid. There’s one particular part between her and Ryan Dean that I adored simply because it shows young love in its best form — awkward, uncomfortable, and the desire for exploration. They are very cute, but I absolutely love how hard Annie is on Ryan Dean because he often earns it throughout the novel. I am so sad in a way that I won’t get another Ryan Dean West story, but on the other hand I loved the way this book ended. It was the right kind of ending that makes you smile given all the crap that happens throughout. It’s not a perfect happy ending, and I’m okay with that. At the end of the day, I am happy that a sequel like Stand-Off exists because it feels so right, even if it didn’t seem like it was necessary in the first place. I still don’t think after reading this that I could choose between the books as to which is my favourite, but I really encourage people to check both Winger and Stand-Off if you want to read some great realistic fiction with a great, saucey male lead. This entry was posted in Uncategorized and tagged arc review, book review, contemporary, grief, male-pov, realistic fiction, Sam, simon teen canada, sports, ya, young adult on September 7, 2015 by samcmar.